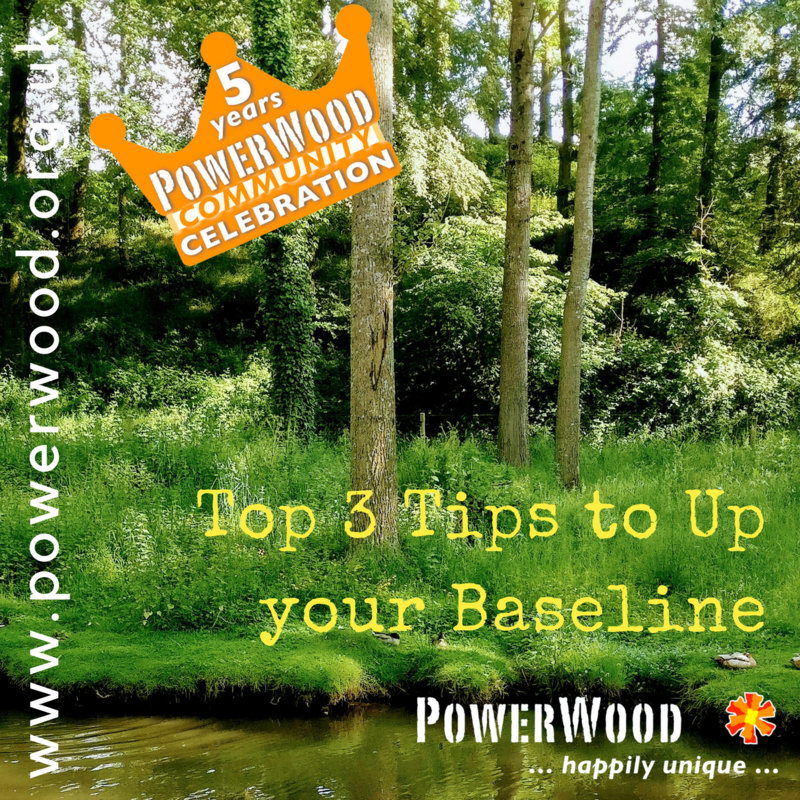 In PowerWood we always talk about our Baseline. What do we mean by that? How high or low our Baseline is defines if in a situation we are able to keep our cool, keep our eye on the target and direct our energy associated with our heightened intensity and sensitivity towards our own chosen goals and applying the PowerWood Tools or if the emotions run wild and/or the situation escalates, whether it is with an attack of despair or anger in ourselves or focus on our child, and we lose control and have further negative experiences. This means clearing the Runway of all unnecessary stressors or irritations is of real importance to having a strong Baseline. How high or low is our energy level, do we have enough energy to keep on top of things, do we have excess energy to do something new. How bouncy is our emotional resilience, do we get easily upset if something doesn’t work the way we want or are we able to take it and use it towards achieving our goal. We believe that the level of our Baseline defines if we are able to prevent an internal or external escalation in ourselves or if applicable other family members from happening yes or no. The strength of our Baseline defines if we are able to direct our energy towards self-chosen goals or that we fall back into childhood patterns or as we call them Involuntary Mechanisms (IM). The Multilevel Emotion Regulation Theory (MERT) is giving understanding, practical tools and strategies to apply in the moment to prevent escalation and help to strengthen the Baseline in general while staying compassionate with ourselves and others. Emotional OE people have the tendency to put everyone else’s needs before their own, because it is so hard for us to relax when someone else is suffering. The more tired we are, the harder it is to distance ourselves from others’ feelings and to make the distinction between what we feel ourselves and what others are feeling. We are triggered in our stress response and experience the Cycle of Emotional and Sensory Overload. So we feel the deep need to fix until we are finally free… But there is always someone in emotional need, whether it is a child, family member, or a pet. If we don’t prioritise ourselves, there will never be a time to recharge and we will end up eternally exhausted and we even might become depressed. If we don’t take good care for ourselves and prioritise ourselves we will end up in such a state that we can’t take good care of others, either. Our energy level sets the tone for our day. On low energy days, we get up and wish the day was over before it even started. On other days we have enough energy to keep on top of things and enjoy our daily life. Our energy level dictates whether we have enough energy to do something new or respond creatively in a challenging situation in such a way that we prevent an escalation, or whether we feel that our whole life falls apart and that we have lost control of anything. How bouncy is our resilience? Do we get easily upset if our neighbour is grumpy with us or something doesn’t work the way we want, or are we able to use the opportunity to grow and take all the negative thoughts and use our energy towards achieving our goals? We believe that the level of our Baseline affects our ability to prevent an internal or external escalation in ourselves or others from happening. The strength of our Baseline defines whether we are able to direct our energy towards self-chosen goals or whether we fall back into childhood patterns (as we call them, Involuntary Mechanisms). 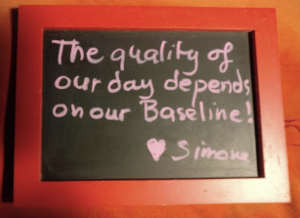 The Quality of our Day is defined by the strength of our Baseline. What can we do to up our Baseline? Being in the moment is a very soothing space creating activity. Any type of mindfulness, whether it is praying, meditation or mindfulness exercises will help create stillness and calm the internal storms you experience or at least make the waves less high;). If you have any practices that you can pick up again or increase the frequency, go for it. In my personal experience mindfulness exercises really up your Baseline, energy and resilience-wise, so it’s worthwhile adding to your Baseline toolbox. The article ‘Use Mindfulness to Create Better Habits’ includes a Guided Meditation. If you are not used to practising mindfulness, any of these Mindfulness a practical guide to finding peace in a frantic world by Mark Williams and Danny Penman is a good place to start. It will offer you a range of different mindfulness exercises that you can explore and pick the one that suit you best. From early morning we start building up tension, our aim is to prevent it to continue building up therefore preventing escalating whether that is by externalising e.g. picking fights or by internalising e.g. having not helpful thoughts about ourselves. To up our Baseline, the 4-7-8 breathing technique (a 60 second exercise) will help you increase your Energy Level and Emotional Resilience. This breathing exercise is the strongest I have ever come across and helps us be in charge of panic attacks, adrenaline highs or lows, night terrors, falling back asleep and upping our Baseline, in general it helps us to get out of an emotional block (and the involuntary mechanisms that go often hand in hand with them) and allows us to access our thinking abilities again. To up our Baseline, just do it twice a day, that will also help accelerating kicking in the calming effects when we apply it in a stressful situation. Before you begin, place the tip of your tongue on the roof of your mouth just behind your teeth, and keep it there throughout the exercise. Exhale completely through your mouth quite forcefully, so you make a ‘whoosh’ sound. 4 -Close your mouth and inhale quietly and softly through your nose for a mental count of four. 7 – Hold your breath and count to seven. 8- Next, exhale completely through your mouth, making another whoosh sound for eight seconds in one large breath. Now inhale again and repeat the cycle three times. Remember: All inhaling breaths must be quiet and through your nose, and all exhaling breaths must be loud and through your mouth. It only takes 60 seconds, so if you do this every time you are aware that you are building up tension, you can prevent the tension building up, which helps you prevent any escalations from happening. We are allowed to take time out too, the world won’t die if we do! 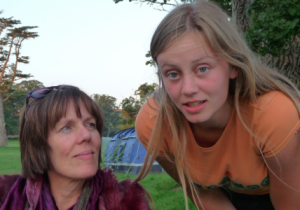 Being an introvert I found the constant talking and the demanding of my emotional availability by my daughter when she was younger quite difficult. Of course, there are many ways to deal with such a situation but for me, the following worked best. I allowed myself to have some time off from her constant talking too, so I would say, ‘I don’t mind you talking, but I won’t respond or listen to you for the next hour’. I would set a timer so she would know when I was there for her again. I would take my daughter for walks, as the movement would calm her psychomotor OE need to talk and the silence would do me immense good. Being silent can do a world of good as described in Science Says Silence Is Much More Important To Our Brains Than We Think, e.g. it can relieve stress and tension. You don’t always have to be there for others – take time out when you need it. Thank you for reading and I hope it helps. Do let me know what works for you:)!